1. The most expensive drawing ever sold is Raphael’s Head of a Muse. A 1519 chalk drawing (a study for his Transfiguration), it sold for £29.2 million (about $47.6 million at that time) in 2009, at Christie’s. 2. 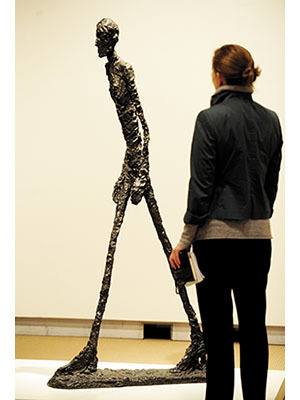 For sculpture, the top price paid is £65 million ($104.3 million) for the L’Homme Qui Marche I, by Alberto Giacometti, sold to an anonymous telephone bidder at a Sotheby’s auction in London, in 2010. 3. The highest ever paid for a painting was a private purchase. The Qatar royal family paid over $250 million for one of five known versions of Paul Cézanne’s Card Players series. Though the sale happened in 2011, the world found out only in 2012. Private sales stay very private indeed, so it’s possible that someone somewhere paid more for art, but we may never know. Plus there are some works, usually in museums, which are never likely to go on sale. They are, quite literally, priceless. 4. Books seem less in demand. The most paid for one was the only known copy of Leonardo da Vinci’s 16th Century notebook of scientific writings, known as the Codex Leicester. It was sold to Bill Gates in 1994, for $30.8 million. on the bankward journey of Avatar’s producers, who made $2.7 billion. 6. The apple-green 1962 Ferrari GTO owned by collector Craig McCaw is the most expensive set of wheels in the world. McCaw paid $35 million for it in 2012, buying it from Dutch businessman Eric Heerema.